This tutorial provides you with a foundation for working with Adobe Premiere Pro media. It is the first lesson in the Adobe Premiere Pro CS6 Digital Classroombook. For more Adobe Premiere Pro training options, visit AGI’s Premiere Pro Classes. Premiere Pro creates a link between your project files and the files that you import into the Project panel. This linkage system allows you to have a very small project file, but at the same time requires that you manage the media you are using in your projects. If you move, rename, or delete files that you are using in a project you will receive a missing media warning when Premiere Pro starts up. You should always locate any missing files before attempting to proceed with your project. The process for locating missing files is automatic and will help you find video, audio, still images, and even preview files. The next steps are not intended to be followed now but are instead presented here as reference for when you do encounter a missing media warning. 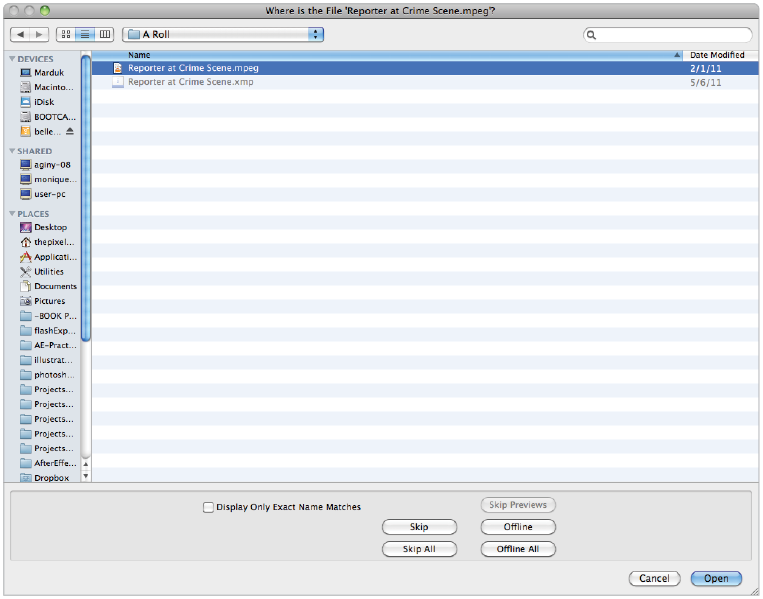 1 When presented with a file browser, verify the file name at the top of the dialog box. This is the file that you are currently trying to locate. The application will automatically open the dialog box when a project with missing files is opened. 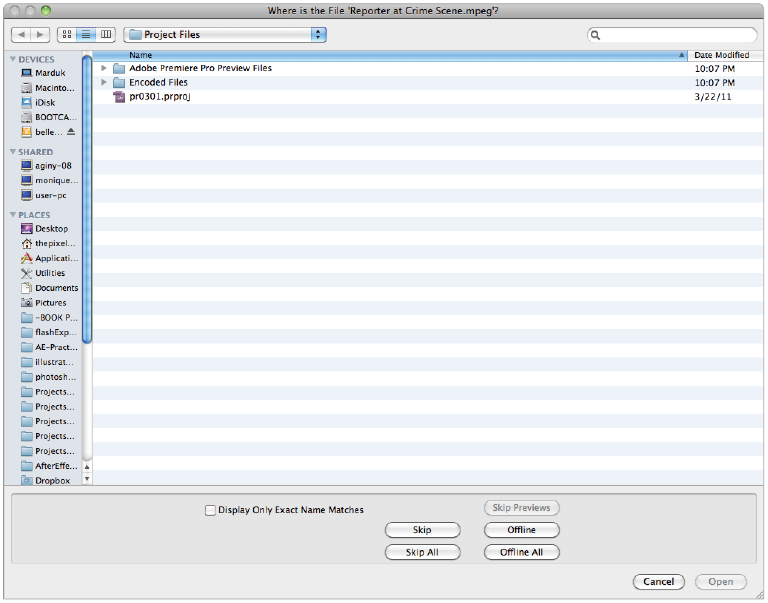 2 Navigate to the missing file, highlight it, and then press the Open button to relink the file. When all missing files have been recovered, the project will open. If your missing files are still in the same relative folder structure as when they were first imported into your project, then Premiere Pro should locate them all, once it knows the location of the first one. If it cannot automatically find other missing files you will have to locate them manually. Once all missing files have been found or skipped, the project will open. There are technically three options when attempting to locate missing files; you can find the file and open it, skip the specific file, or set the file as offline. Offline files can be brought online by right-clicking on them in the Project panel and choosing Link Media from the menu that appears. In addition to the ability to skip and offline individual files, you also have buttons to skip and offline all files the application is currently attempting to locate.